Mass Effect 3: Extended Cut will be a free DLC pack released this summer to provide "closure" to anyone who wants it. After weeks of heated discussion over the end of Mass Effect 3, developer BioWare has now announced that it will release an epilogue of sorts for the game in the form of a free DLC pack. Entitled Mass Effect 3: Extended Cut and set for release this summer, the pack contains "additional cinematic sequences and epilogue scenes" designed to bring a deeper sense of closure to any fans who want it. "Since launch, we have had time to listen to the feedback from our most passionate fans and we are responding," said Ray Muzyka, a BioWare co-founder, announcing the DLC. "With the Mass Effect 3: Extended Cut we think we have struck a good balance in delivering the answers players are looking for while maintaining the team's artistic vision for the end of this story arc in the Mass Effect universe." "We are all incredibly proud of Mass Effect 3 and the work done by Casey Hudson and team," added Muzyka. 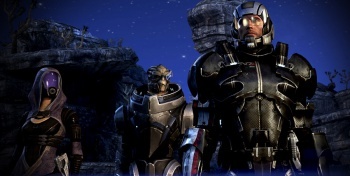 Mass Effect 3 Executive Producer Casey Hudson laid out the schedule for the upcoming DLC. "We have reprioritized our post-launch development efforts to provide the fans who want more closure with even more context and clarity to the ending of the game, in a way that will feel more personalized for each player," he said. So, there you have it. We've watched on as the "Retake Mass Effect" movement appeared, debated, raised tens of thousands of dollars for gaming kids charity Child's Play, sent hundreds of cupcakes to BioWare, filed a complaint to the Federal Trade Commission, and made a hero out of a certain (major ending spoilers under the next link - you've been warned!) Marauder. Was this kind of DLC what they were after? Is this a victory for the movement, or has BioWare forever sullied the artistic integrity of its trilogy? Additionally, it'll be interesting to see how the DLC will manage to provide "additional closure" at the same time as staying true to the original vision of Mass Effect 3's writers. Fans satisfied with the ending are, of course, welcome to ignore the DLC. Are we in for another Dragon Age: Origins-style epilogue? Or maybe something a little more Animal House? Most importantly, will there be more romance scenes with Garrus? Oh, sweet space-Batman. UPDATE: BioWare has uploaded an FAQ for Extended Cut, in which its writers clarify that "the extended cut DLC will expand on the existing endings, but no further ending DLC is planned." BioWare concludes the FAQ by saying, "Are we proud of the game we made and the team that made it? Hell yes. Are we going to change the ending of the game? No. Do we appreciate the passion and listen to the feedback delivered to us by our fans? Very much so and we are responding. Summer is coming..."
A clarification on the clarification DLC, then. And a possible hint that BioWare likes Game of Thrones just as much as the rest of us. Mass Effect 3: Extended Cut will be released for Xbox 360, PC, and PlayStation 3 this summer.